Yep, it’s after ten on a Wednesday night and I’m gonna DAZZLE y’all. With some random things connected by pure awesomeness. After all, my claim of brilliant segues last time was… oh wait. They were fair-to-middling. This photo doesn’t do justice to the gorgeous black-purple of the ripe ones. 1. 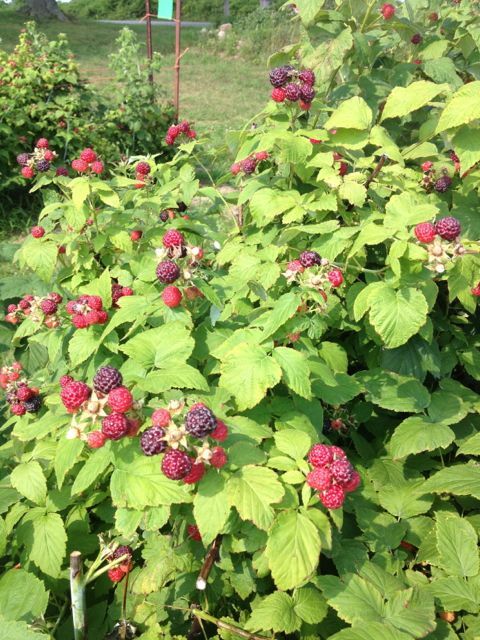 It’s black raspberry season. BEST THING EVER. As kids, we used to scale the cliffs near our house and slither right into the brambles to get these, and they were worth every scratch. Now I know about Marcy’s Berry Farm where you can get them without quite so much peril – but still lots of wholesome dopamine hits when you find fat, juicy berries in luscious clumps. There’s a black raspberry cobbler in the oven right now. Aw yeah. 2. Speaking of local stuff that’s in season, SWEET CORN! Okay, I guess there are two best things ever. Even my picky son was exclaiming about the deliciousness of the corn we munched on tonight. 3. Speaking of my quirky firstborn, I love him heaps and piles forever, but he’s a strange guy. As some of you know (or have witnessed), he has loved arms for a long while. Yes, the limbs, not the weapons. Especially mine. He likes to give lavish kisses to the inside of the slightly-bent elbow. Recently he has discovered he can cut out the middleman (or woman) and kiss his OWN arm. It’s kind of sweet that he expresses such affection toward himself, but the kissing gets on my nerves because it’s, like, really loud and smoochy and frequent. In the car, at the dinner table. In bed while he’s going to sleep. But what kind of mother would I be if I told him to cut out that self-kissing, it’s annoying? After all, I kiss my kids’ kissy cheeks every chance I get. What a terrible example I’m setting. 4. Speaking of self-love, I finally watched Dr. Brené Brown’s viral Ted Talk about her research on shame/vulnerability. Gah, she’s so amazing. (Plus I love to listen to her because she’s from Texas. She sounds like my family.) Now I can hardly wait to read her book, Daring Greatly. 7. Speaking of things sprouting and the heat being on, Queen Elizabeth and I are basically the same person, because here we are, both wondering Where’s that royal baby? Please arrive before I go offline! But then, I’m also practically Kate Middleton because I know about late babies. I know what it’s like to be so overdue that people give up and stop asking. So hang in there, Kate, your baby’s gonna be awesome. So… à bientôt, lovely Di-hards. Oh my God, it’s mid July and corn is ready and I’m still thinking is the beginning of summer where did the time go I need to get corn and how about tomatoes? Sorry for the lack of punctuation, but that’s how my brain said that sentence. Have so much fun at camp. I miss it. I was due July 9th with my Arwen and she came July 27th. I stopped answering the phone because I was so tired of saying, “no, not yet”. Hang in their Kate. They come eventually. started drooling as soon as i saw the picture of those scrumptious berries, and then you mentioned sweet corn! yum! loving this harvest season! have a lovely time at camp! mama lola recently posted..THE Pin Party #14! I’m so jealous of you heading off to camp! I miss camp so much! Daring Greatly was an awesome book, I tend to cry at the drop of a hat (any hat, anywhere) and it had me in tears (the right kind) on the bus. Sheesh, those black raspberries ARE amazing. What I would give to be a scratched-up little kid again, rambling and brambling up in the park, scooping berries into my mouth and slapping bugs. NOT everyone’s idea of awesomeness, but… maybe they just haven’t tasted the cobbler yet. Love you!! See you soon!